Good New Update from The City of San Marcos – This summer, the City of San Marcos refinanced $20.6 million of bonds that will save some property owners money on their Mello-Roos taxes that help pay for important things like grading, streets, utilities, parks, and trails. 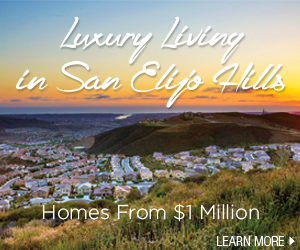 Property owners in the San Elijo communities of Saverne, Azure, Cambria, Woodley’s Glen, Crest View, Waterford, Village Square and Westridge will see an average annual savings of $120 to $450 per residence on a portion of their property tax bill next year. The bond refinancing will collectively save residents in these neighborhoods about $3.9 million over the life of the bonds.